Not a great pic, but I couldn't fight with this coat anymore! LOL!! This is a colonel epaulet. This was machine embroidered then hand stitched onto the leather. This is a full jacket back on the same deer skin jacket! I spent a goodly amount of time digitizing a bit of this one....had it at the size the owner said they wanted it at UNTIL they brought it to me....then it changed! LOL!!! Good heavens! Anyway, I will sposedly be doing the beaded version of this jacket, eagle, buffalo, vines, epaulets and all before too long. I just hope it isn't the finished jacket WITH Fringe. Ughhhh.... stuff is a bit difficult to maneuver around! Enought fussing! Off to post a final pic! VBG! PHEW!!!! Another project done!!! Pics aren't great....taken at ohhhh twelve hundred A.M!!!! 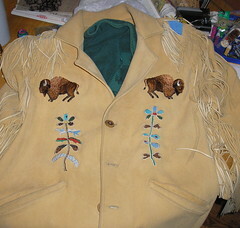 This is a deer skin coat WITH fringe.... that was left with me to embroider last friday afternoon! I had to create the flower vines, re-size and make corrections on the buffalo then hold my breath while this things stitched. I don't "think" i've bought myself a jacket yet! BUT....haven't heard from the owner sooooo...STILL holding my breath! LOL! Now, keep in mind, NO design on this jacket is under 20,000 stitches and my machine stitches at a standard 800 stitches per minute. This doesn't take into account for thread changes, breaks, needle changes.... and I have a commercial machine!!! Good HEAVENS I couldn't imagine trying this on a home machine!!! NOT a slam against em.... just couldn't imagine the hourse that would take cuz this took me the whole weekend!!! Tis done tho! YEAHHHH!!! Another rr I am participating in, is the Sampler rr! We were asked to create 2 eight inch blocks with loooooonnngggg seams! So we would have plenty of room to practice! I was the first in line and had the herringbone, with the optional detached chain stitch! Watch this spot. I have to get the ol 'puter to cooperate and i'll get closeups loaded for everyone to see! Anywhoo....another one done. 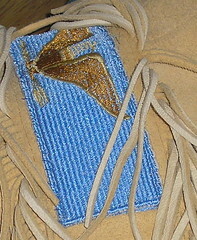 Off to embroidery for my re-enactor friends....again....on their deerskin full length jacket. NOOOOOO room for screw up there......sooooo, wish me luck!!!! Second block done in the DYB round robin! This one is for Jakkie! I had a bit of a brain blank and FINALLY at oh zero hundred in the night inspiration came! LOL!! 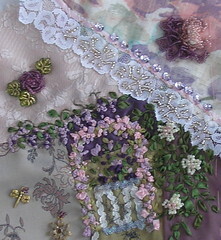 I had some dyed rococo braid that made the foundation of the arbor, the I added sre leaves and roses. 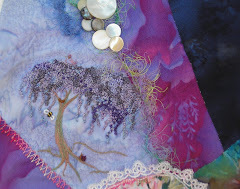 Next to that is the sre magnolia tree with beaded flowers and the the wisteria on top. I beaded a cabbage rose up above, and the used a bead treatment to pull out the rose on the other patch that is held down with the herring bone, ribbon woven thru, sequin flowers and then beaded the roses on the lace. I hope she likes it! This is the final panel! These are ALL off to their owner for construction now! I hope to get a pic of the completed costume!! I did my best o replicate the original design so that the costume will be authentic. Think I succeeded? Almost done! This is one of the panels for the skirt. This is a combination of machine embroidery and hand embroidery! Again, the fabric had to be backed to control the stretch. Approximately 80 hours has been spent in design, digitizing and embroidering this costume. This is the gaitors. They top gloves in the western costumes....I rather thought that they were cuffs for the jacket. Regardless, they are also entirely hand embroidered with rayon. Thankfully the owner is pleased! Here is a pic of the collar. This was entirely hand embroidered. The material is a stretch gabardine which was a challenge for me, so I fused a light weight webbing to the fabric to stabilize it. All of the embroidery is done with rayon. This is the designs. 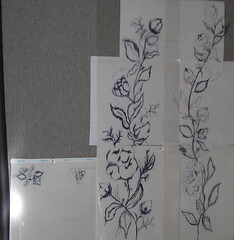 Hand drawn onto a plastic film that I then placed onto a light box to trace onto the panels. As many have read here, I do a lot of embroidery for a friend that is heavily involved in character re-enactment. The latest project I completed for her is DONE!!! YIPPEEE!!!! I took this pic and then designed the panels on the skirt, collar and gaitors. 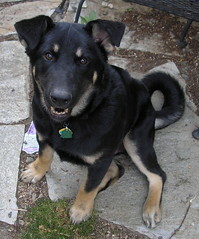 Here he is just hamming it up! NOOOOOO personality here! LOL!! 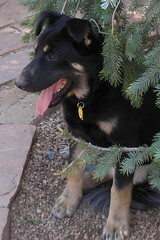 I FINALLLLLLYYYY got this little imp to sit still long enough AWAY from the tree to get a good pic! You'd never know, to look at him that he could wreak such havoc! LOL!!! He brought home kennel cough that swept the house. Thank heavens everyone is finally feeling better!!! After supporting the drug companies for all the antibiotics! LOL!!! He's cute....and DEFINATELY allllll puppy!!! Gooood grief I forgot how busy they can be! LOL!!! Looooookkkkk out!!! Here he comes!!! Kona.....THE PESTTTT DOG!!!! LOL!!!! 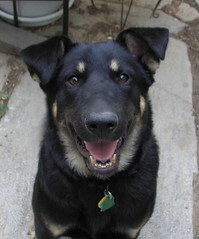 Here's our recent addition.... another "rescue" dog from the pound! All of.... or so they said... 6 months old! ALL energy, pestiness and cute, cute, cute! Still chooses whether or not he'll respond to his name, is ornerier than all get out, but has all the makings of a lover dog! Course.... what four legged doesn't love? I'm sure there will be more pics to come as he continues to grow into those mammoth feet! VBG!! !